Thanks for your hard work. I'm trying to use tftpd32 or "tiny pxe server" to boot over Ethernet a Mirotik RB951G-2hnd. Normally I use dnsmasq, however I'd like to try do it on windows. However on tftpd32 it seems like the router ignores the DHCP response. 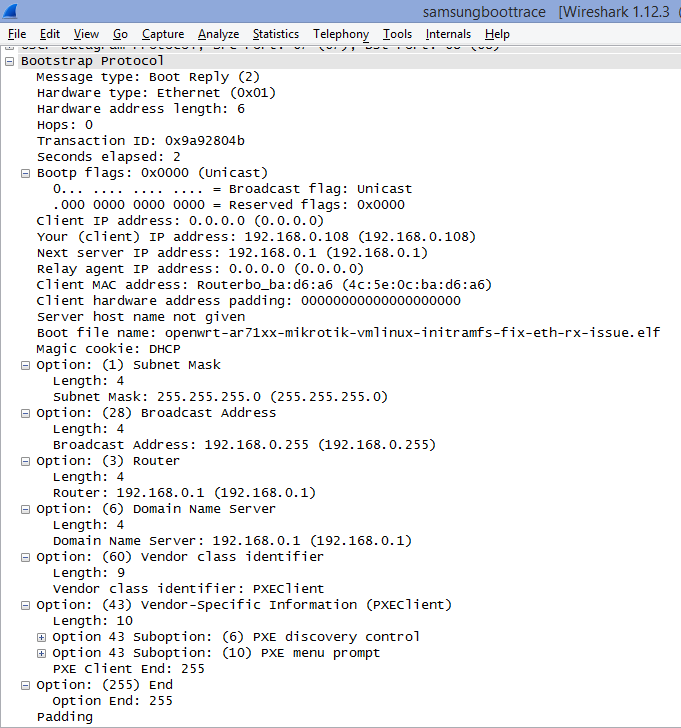 The log file continually prints request from 0.0.0.0 with MAC address xyz. Then the next line is the correct lease. This just repeats all the time. I've used a hub to confirm that the packets are going back and forth. The only significant difference I can see with dnsmasq & tfpd32 is that your destination field with the DHCP response is the broadcast address 255.255.255.255 where as dnsmasq uses the new leased IP as the destination field. Could this be it? I was going to try write a quick patch but I got loads of Visual Studio errors, most likely incorrect vcproj/Makefile problems so I thought I'd ask here before I began. I can only talk for TinyPXE Server. The packet being unrecognized (malformed? ), TPS will not process it further. 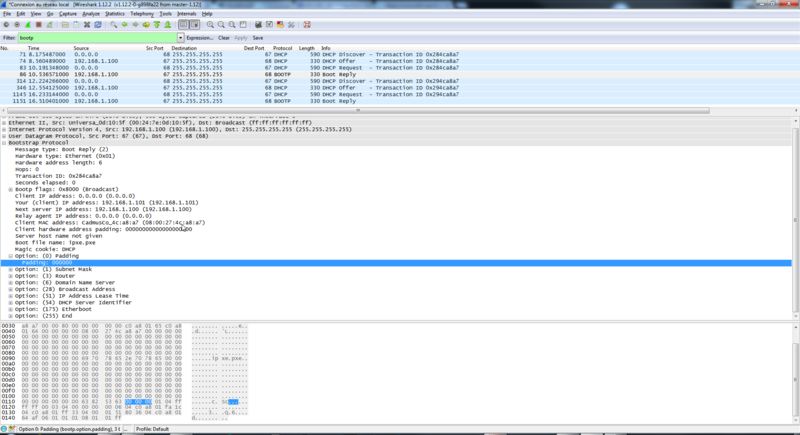 If you capture it in wireshark and send it to me I could may be fix TPS to handle such packet. In dhcp mode, you can only answer (offer and ack) back to 255.255.255.255 since the client does not have an IP until the very last stage. Edit : you meant mikrotic right (instead of mirotik) ? if so, I am bit lost : mikrotic is a router/ap/dhcpd, why do you need another dhcp server? 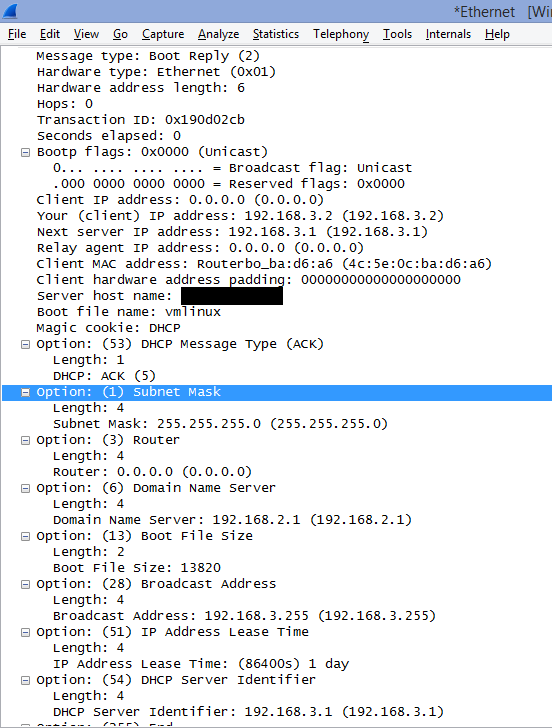 Below is a screenshot of the DHCP packet, is that enough info? Oki I believe this is a bootp request (rfc951) not a dhcp request (rfc2142) since option 53 is missing. Edit config.ini, add rfc951=1 under [dhcp]. You should no longer read "unrecognized packet" and the boot request should be handled as a dhcp request. This is a blind patch : I cannot test over here. Give it a try and let me know : further adjustements may be needed. EDIT : to be discussed later, you may have to update opt60 in TPS to match your hardware. Thanks so much for patching for me. Now I'm not getting errors but its behaving like tftpd32, it sends a response but the router seems to ignore it and continually send requests. I've attached a pic of TPS and also the response packet which I've split into two images. I'm very interested in the opt60, image you mentioned above. i'll have a look at these screenshots and will report back. 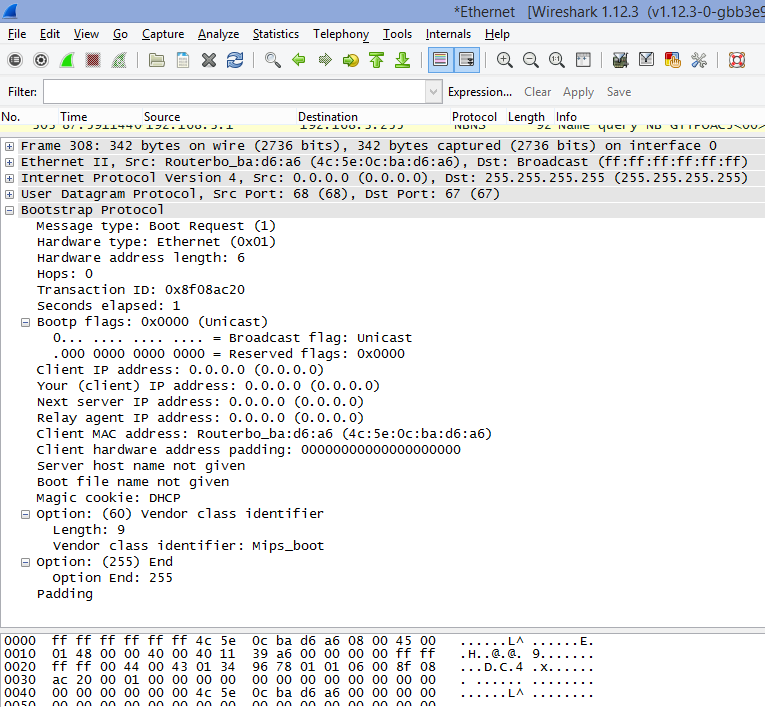 would you be able to mail/pm me a capture from wireshark? and opt60, see in TPS in the lower part of the form (click on the arrow) and make sure it matches your classid (mips_boot). The issue could be with the servername filled. I have the feeling it should be empty in your case. See here : https://tools.ietf.org/html/rfc951 . Either that or the bootp client does not like the extra DHCP options. Sure I can send you the wireshark, although all DHCP files look like that. How can I send it to you? How could I remove the servername and other DHCP options. Is it possible via the config file? Edited by iainf, 11 February 2015 - 04:00 PM. I would not worry too much about your servername : it does not put you at risk. If really a matter for you, edit the pcap file with an hex editor (like hxd). Put no_hostname=1 under [dhcp] . 1/Note that opt6 and opt28 differs between your dnsmasq and tps setup. 2/You also seem to have a specific opt43. I dont think this this will prevent the dhcp lease to happen but worth mentionning. Thanks again but I tried and checked wireshark but it didn't work. I think I know what it could be with the working version wireshark recognizes the file response as "Boot Reply" with TPS it comes up as "DHCP ACK". Then when its building the file if it sees the Opt 53 or Opt 100 it skips it and doesn't include in the file. I made up opt 100 just to show the example. Thanks again you're help is very much appreciated ! you mean that even with the hostname field empty, it does not work? or do you mean the no_hostname option did not work as expected (i.e null the information) ? I did not test but inputing 0.0.0.0 for every field when an IP is required might skip it then. I'll review my code on my side but you may want to try it already. discard the above. wont help. let me implement a ignoreopt53 as a test. is that the only option that should be skipped? i am trying to find a bootp client at home (no luck so far). i tried with a wrt54gl (linksys) with dd-wrt but no bootp there. now trying with an old network card. once i find a bootp client, i will be able to support it very quickly. EDIT : send me some wireshark captures. it will help. both working and non working. new version uploaded. give it another try. new version will not fill in opt53 (dhcp message) if it detects a bootp request (i.e not a dhcp request). opt54 is still there for now. and the vendor buffer size differs from bootp (64 bytes) to dhcp (254 bytes). See my latest post above. Give a try to latest version. Oki latest version (uploaded a few secs ago), now sends correct "BOOTP Reply" frames. By correct I mean recognized as such by wireshark. The trick was indeed to strip out option 53 (dhcp message). So now Tiny PXE Server is compatible with bootp requests (next to dhcp requests) : thanks for your help in achieving that. Would you care to do one last test? Remove no_hostname=1 and no_opt13=1 and leave only rfc951=1.